Mayor Eric Garcetti and the Board of the LA Metro have plans to build dozens of public transportation projects and enhancements through 2041, funded by voter-approved Measure R and Measure M countywide sales tax increases. 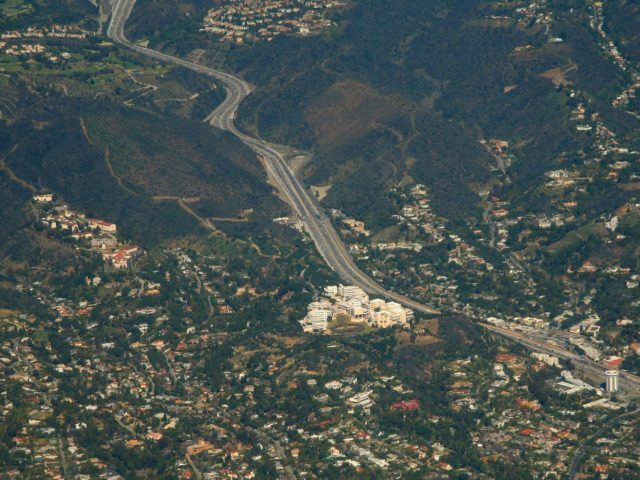 The Sepulveda Pass was first graded in the 1920s; paved in the 1940s; expanded into eight lanes in 1962; and then widened to ten lanes in 2014. As L.A.’s most congested roadway with 300,000 cars a day, urban planners had hoped to introduce light rail in the late 2030s. But after Los Angeles was awarded the 2028 Summer Olympic Games, Mayor Garcetti began previewing what he calls the “Twenty-eight by 28” initiative to prioritize completion of 28 major transportation projects before the opening of the Games. The Montreal (1976), Rio de Janeiro (2016), and Athens (2004) Summer Olympics caused massive political turmoil and bankrupted governments due to massive cost overruns from spending on sports and housing venues. But Los Angeles adopted a “Spartan Summer Olympics” model in 1984 that relied on the private sector and never spent a penny of government funds. The LA84 Organizing Committee signed a $225 million television rights deal with ABC, drummed up multi-national sponsors, and relied on using 75 existing facilities to generate a $232.5 million profit and provide a $93 million endowment for the LA84 Foundation that continues to mentor youth sports across Southern California. With Los Angeles winning the right to host the 2028 Games by making another “Spartan Summer Olympics” bid with no government funding, Garcetti is hoping to find a public-private partnership or other funding structure to launch his first three projects. These include the Sepulveda Pass transit corridor, West Santa Ana light rail line from Bellflower to Union Station, and the Gold Line extension to El Monte. The Metro meetings are being advertised as an effort to explore options to for a subway, underground light rail, freeway-running light rail, or even a Disney-style elevated monorail train. The taxpayer cost of the Sepulveda Pass transit corridor is estimated at about $5.7 billion, plus another $3.8 billion to extend the line to LAX airport, according to a report by Southern California Public Radio. Metro seems to have no interest in a joint venture with Elon Musk and his Boring Company, which is racing forward to build a 39-mile privately funded “Hyperloop” system of subterranean tunnels under Southern California that could whisk passengers from downtown Los Angeles to LAX Airport in eight minutes at a cost of $1. Breitbart News reported three weeks ago that Musk impressed his audience at Bel Air’s beautiful Leo Baeck Temple when he announced that The Boring Company had received an environmental waiver to apply for construction permits to build the first link of an all-electric network that will propel a ten-passenger magnetically levitated people pod called a “Loop” at speeds of up to 150 miles per hour. The Boring Co’s L.A. build-out project manager, Steven Davis, released a Loop animated video, and discussed the first two-mile tunnel the company drilled under SpaceX’s headquarters in Hawthorne, California. Davis promised that with pending regulatory approvals expected in the next couple of months, the company could begin offering free public rides.